Teaching WordPress to students should not be difficult after all. Since WP is easy to understand, the only question remaining here is where to start, how to synchronize the available data, and how deep one should go when explaining all the details. And if you are currently thinking of creating a schedule for the absolute beginners and teaching them some WordPress basics. Why teach students WordPress basics? One might have a number of reasons for it. First, in the process of learning WordPress basics some of the students might show a great coding potential. While dealing with simple “copy and paste” tasks, they might get interested what other things they can do - and really dive into the process. Besides, teaching WP is extremely exciting. So, students will gladly come to classes and do their homework. And keeping students engaged and interested are among top priorities for all teachers. Remember that in the future employers will value the fact that a student of yours has solid knowledge of WP basics. Thanks to the popularity of their technology, user-friendly interface and lots of other benefits, WP is known worldwide. In fact, Manage WP states that “WP now powers 26% of the world web”. And one of the most popular resources like The New York Times and the National Geographic are powered by WordPress. Finally, teaching it is very beneficial since you will be able to develop a number of useful resources together with your students. For once, you can all develop a blog where kids will publish news, updates, and even essays for the general public. This will open the doors for parents making it possible for them to keep up with the latest news at schools, create team spirit between all the classmates, and engage young people into day-to-day class activities. So, the only question left now is how to teach it to the kids in a way that they will understand it and be ready to put it to use right away. After searching the web for some of the most useful answers, we have created a list of ways you can use in your classroom. Just take what we have prepared - and let the kids enjoy the process along the way. Besides, this can be one of some great process analysis essay topics ideas. So, why not using our thoughts here? There is so much information your students have to learn about WordPress that you might feel overwhelmed having no idea where to start. That is why, we recommend you starting from a short overview of what WordPress really is and how they can use it later. Start with the dashboard. Click on different menu items and explain what they can do at each one of them. You are probably wondering whether they will actually remember any of what you are saying at this stage. Well, they won’t remember everything, but something will stay with them for sure. You do not need to repeat every single concept 160 times, but mention every item on the menu at least several times to make sure that kids really know what you are talking about. You will get back to each item later. For now, simply introduce them to the main idea behind WP and explain how basic administration here looks like. Since your goal is to teach students how to build real websites using WP, show them some examples of sites like NY Times that were built and are powered by WP. This will inspire them and encourage to try different things on the platform. Show them what those sites can do, what features they have, and how they can create a similar site once they master WordPress basics. It is a well-known fact that good examples truly inspire us. So, choose the ones they will find the most fascinating and do a little presentation for students before they dive into the process of their own website development. You do not necessarily have to teach all the information yourself. There are tons of useful tutorials you can use from time to time to explain some deep knowledge or specific basics. Find a few sources you can really trust - and use those videos once in a while. Not only it will free you from the burden of preparing lots of lessons all by yourself but also gives a student a chance to learn from somebody else and benefit from a different style, approach, techniques, etc. Start with explaining to your students that each website consists of a number of pages. For instance, New Yorker consists of the News, Culture, Books, Business & Tech, Humor, Cartoons, Magazine, Video, etc. Each of these pages has a number of subpages. These pages all add up to the main purpose of the website since all of them are used for news updates. Ask your students to come up with at least three pages they want to see on their own website. They might have a Blog, some News and a Home Page (or anything else they find necessary). As soon as they figure out the pages, explain how to add them in WordPress and how to insert content on each one of them. This should not take too long especially if you offer them to take content creation as a home assignment. So that they can simply copy and paste it in the class. Depending on the pages your students pick for their websites, offer them a range of free themes they can apply to their site. They might opt for a minimalistic theme if they are only going to post updates on their blog or an impressive theme that best fits photographers that want to post their pictures online. All in all, just explain the main concept of having a theme on their website and offer them a list of options they have. And leave the rest absolutely up to them: you will see how much they will enjoy comparing and choosing free themes and thinking of what will look best on their site. Then show them how to apply one and how they can adjust each theme to their needs. This should be the starting point of their WordPress journey. Once students realize what they want to do with their website, invite them to create their first page. Developing this page might consist of several stages. First, play with the fonts and text editing. At this point, you can let your students try and see how text editing works and how they can change the style of their website with different fonts. Show them where to find shortcuts and let them play a bit with them. Then show them how to add links. Hyperlinks are extremely important, so explaining how to work with them would be job one. Finally, show them how to insert pictures. Images should have a certain size, besides there must be margins and padding. Explain them all the basics - and move on to the next stage. Buttons are very important when it comes to a website. Therefore, make it a part of your teaching plan to help students learn how to build quality websites. There are several types of buttons you are to take into account. First, there are social buttons which allow the users share the information they found on your website directly on their social media. Normally, WordPress has these buttons. So, all they have to do is simply drag and drop them onto the page or choose them in the sidebar. You can also show your students the “Follow us” buttons that can be linked to their social media profiles. By clicking on those buttons, users will get directly to one’s online profile. Adding them should not be a big problem either. These buttons are typically among the standard ones. So, adding them should be easy too. Your students should know their way around plugins too. There is a great number of plugins your students might want to install: Google Analytics for WordPress, MailChimp, NinjaForms, Popups by Optin Monster, etc. They are all quite useful, so teach your students to use them by showing them a step-by-step video guide. This will save you much time - and your students will be able to watch the parts they did not understand over and over again. Explain your students where they can find all the technical support they need. Of course, they can always ask you basic questions in the beginning. However, as soon as they start their own site, you won’t be around all the time. So, access to quality support will be needed. They can always go through WordPress FAQ to see if they can find answers to their questions. If not, then going through support forums or contacting the technical support itself can be a good idea. These guys definitely have answers to all the WordPress-related questions. So, why not ask them directly? Finally, explain to your students how hosting works. The students might want to purchase a domain or use free options. Whatever they choose, help them understand what options they have first. Purchasing a domain name is a good idea only in a case a student wants to build up and use later that website. But if a young person is simply building a website to polish his WordPress skills, this will be just a waste of money. Now as all these basics are covered, your students are ready to go and develop their own WordPress site. Be supportive and be there for them. And also show interest in their beginnings. It might not be easy at first, especially if this is their first time trying things like this ever. Besides, be enthusiastic about this project. As you build on your own site while showing how you are doing it step by step, spread the joy and excitement: this is the only way to keep your students truly interested and engaged into the process. You can run contests to see whose site is the best and have peer-to-peer reviews to ensure the transparency of the process. This will add in some fun to the process. And do not forget to develop a blog for your class. Not only it is a great idea because all the kids will have a chance to add something special and unique to the development process but also you can later use this blog to keep parents updated on the latest news, upcoming events, etc. Everyone will have fun and benefit from the process. 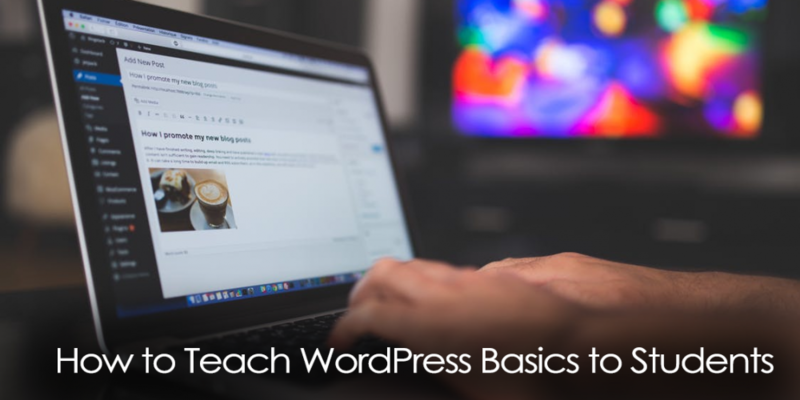 Should you need more resources on how to teach WordPress basics to students, check out WordPress’ original directory for more ideas. Learn WordPress site offers you a whole list of tutorials to go through while building your site including a tutorial about widgets, menus, going mobile, etc. Do not lose a chance to pick a couple of good ideas from there too!